Woodland creatures and themed items have been rising in trend recently and showing up in various areas, from artwork to accessories. The rustic charm, magical enchantment and whimsical nature are popular traits of the woodland trend, which makes it such an appeal to children and adults. If you’re looking for something special in this spellbinding trend, then take some time to browse through our list of woodland-themed items! In this woodland realm, you’ll find carefully selected pieces that were handmade by indie artisans to form our woodland-themed gift guide that will surely please anyone, from toddlers to appreciative art lovers. Whether for a gift for a beloved friend or a special piece to add to your home, our guide will help you explore this magical realm of the woodland world. 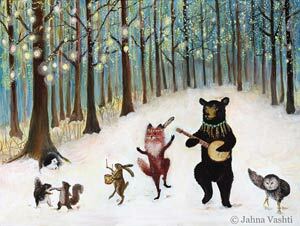 Come play with the musical woodland creatures in Jahna Vashti’s woodland animal art print! These woodland animals, including a banjo-playing bear and dancing squirrels, are happily enjoying this festival in a winter woodland area. Jahna Vashti has these woodland characters playing in other season-themed laser prints as well, so be sure to check out the other woodland animal laser prints and collect this seasonal series of prints! 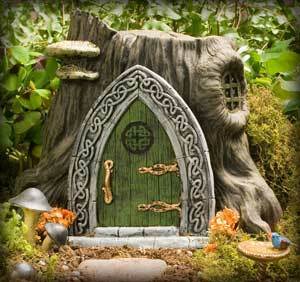 Create an entrance to the other realm of fairies with the Hidden Worlds’ Celtic-styled fairy door! This quaint and whimsical door displays a Celtic knot design and a beautifully contrasting color combination of dark grey, forest green and vibrant gold. Place this fairy door in your garden, against a tree or in your home to give fairies a way to enter our world. Find more incredible fairy doors in various designs and colors in Hidden Worlds’ shop! 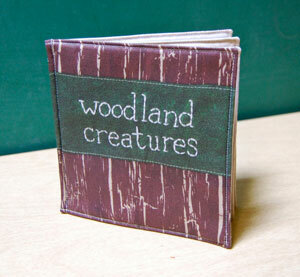 Teach your little one all about different woodland creatures with Ex Libris’ cotton cloth book! Made with organic cotton fabric and with pigment ink printed animals, this cloth book also makes a cuddly companion if your child becomes attached to the book. Find more fun cloth books in Ex Libris’ shop and build a cloth book collection with your children! Keep track of the new year with Carol Farrell Illustration’s woodland animals calender! 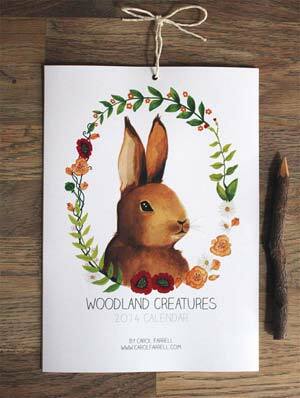 This calender presents a collection of colorful illustrations of woodland creatures and scenery. Each month has its own featured woodland animal, so you’ll always have a delightful, whimsical creature watching over each month for you! 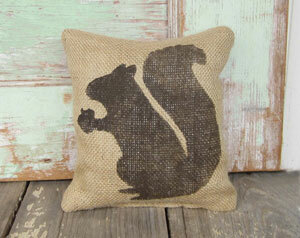 Carol Farrell Illustration’s shop also has other woodland creature creations, so be sure to check them out! Wrap yourself in Shebbo Design’s antler patterned scarf! In an off-white color, this simple yet sophisticated scarf is one you can wear during daytime activities or evening outings. This scarf is created with high quality cotton pashima fabric and hand-stamped with grey-colored deer antlers for a rustic, country chic look. 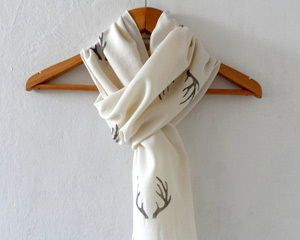 You can find more antler-printed scarves in Shebbo Design’s shop! 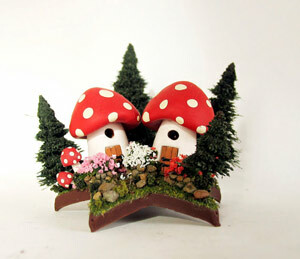 Add your own magical world in your garden or home with Bewilder & Pine’s mushroom fairy woodland house! This piece displays two quaint red and white spotted mushroom homes that are surrounded by forest elements, such as a rabbit bush. Formed with polymer clay, this detailed piece of magical art is the perfect addition to your fairy tale garden. Send your little one to the magical woodlands with Carrot Fever’s woodland animals mobile! 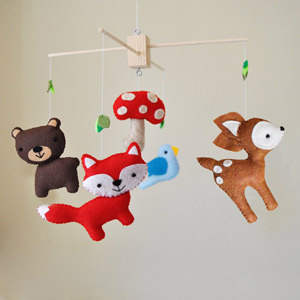 With this mobile, you can choose five woodland plushies to add to it and make it completely personalized for your baby. These plushies are made with eco felt and cotton thread. Small, green leaves add more forest-like elements to this adorable mobile. You can also add a musical button that either plays “Twinkle Twinkle Little Star” or “Rock-A-Bye Baby” to ease your baby into a sweet slumber. Accent your home and secure your keepsakes in Cattails Woodwork’s acorn boxes! 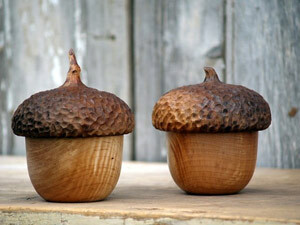 These keepsake boxes are made with quality wood and is shaped into realistic acorn shapes. Each box is 5.5 inches in height and 5 inches in diameter, which is a great size that doesn’t take up much space on tables, dressers or bathroom counters. Use this keepsake box as a rustic decoration and storage area for buttons, jewelry, coins and more. Let golden leaves from magical, woodland trees fall in your hair with Dreams By The Sea’s gold leaf hair clips! Featuring a branch with five golden leaves, these clips are present an elegant appearance yet can be worn even on casual day outings. 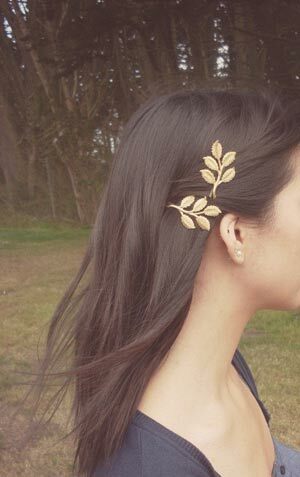 These two hair clips are crafted from antique hair pins and golden brass leaf branches. Perfect for fine hair, anyone can wear these hair clips as an everyday accessory. With this whimsical pair, you can feel like a goddess from the woodlands! A silver version of these hair clips can be found here. Let Next Door To Heaven’s friendly squirrel be your helpful doorstop! Whether you’re moving or carrying tons of grocery bags into your home, this handy and rustic doorstop will be a convenient tool to have around. Along with being useful, this doorstop is also a great home decor item that you can place anywhere. Made with burlap and filled with sand, this doorstop comes in various colors as well, such as cream and pink, so that you can personalize your doorstop to match your home decor needs. Woodland-themed items are also great for weddings if you are looking for a country chic themed ceremony. With the rustic charm that woodland-themed products bring, you can have a comfortable, country chic wedding that will bring a home-y atmosphere with a touch of elegance to your special day. 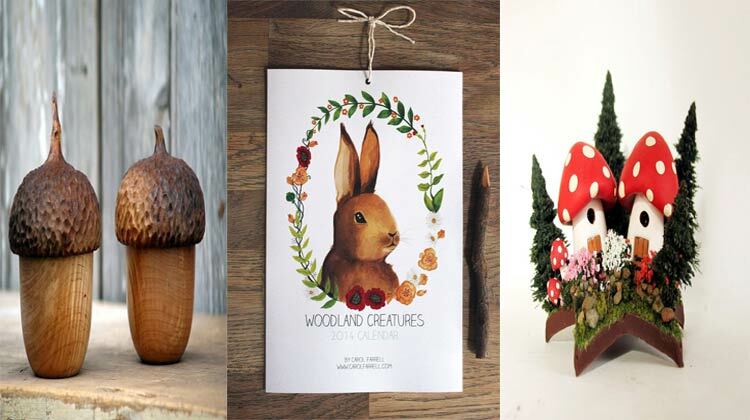 Woodland-themed items don’t always have to have woodland creatures on them; you can simply search for shabby chic or rustic wedding items at Etsy or other indie sites to find great decorations and more for your wedding. Enjoy your woodland adventures!